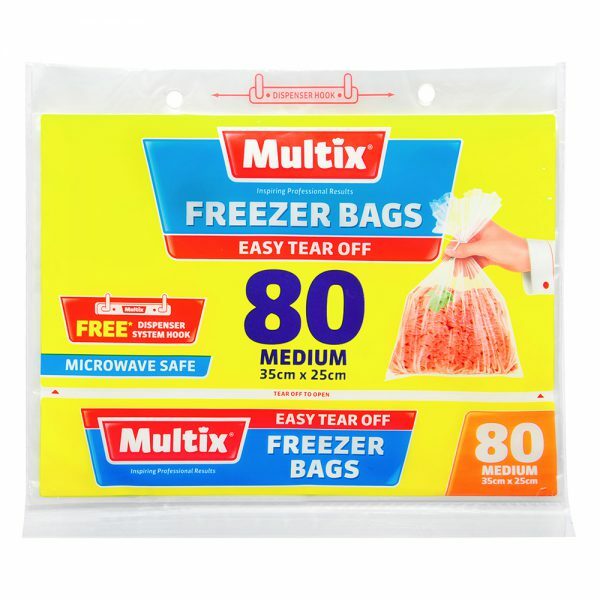 80 Medium Multix Freezer Bags that are easy to tear off and are microwave safe. Size: 35cm x 25cm. High density film keeps food fresher for longer. Safe to use in microwave. Strong, reliable and safe for food storage. Multix Freezer Bags can be used to line food for easy separation when frozen. To avoid freezer burn expel as much air as possible before tying off the bag. Do not refreeze thawed foods. Do not use Multix Freezer Bags with a browning dish. Do not use twist ties in the microwave. Use Multix Freezer Bags as a barrier to prevent splattering and to speed up cooking in the microwave. When removing food from bag be careful of hot escaping steam. Avoid bag contact with hot fatty foods. Use self tapping screws to screw hook into cupboard door. Tear off the bottom of the pack. Remove Freezer Bags from pack and place onto dispenser system hooks. Dispense Freezer Bags as required.